This year I’ve been on a mission to use up a lot of products that I have previously opened and sticking to the same few products as best I can in a bid to use up as many of the products in my stash as I can. Alongside this of course I am always trying out new products and always trying to be consistent in using them too. 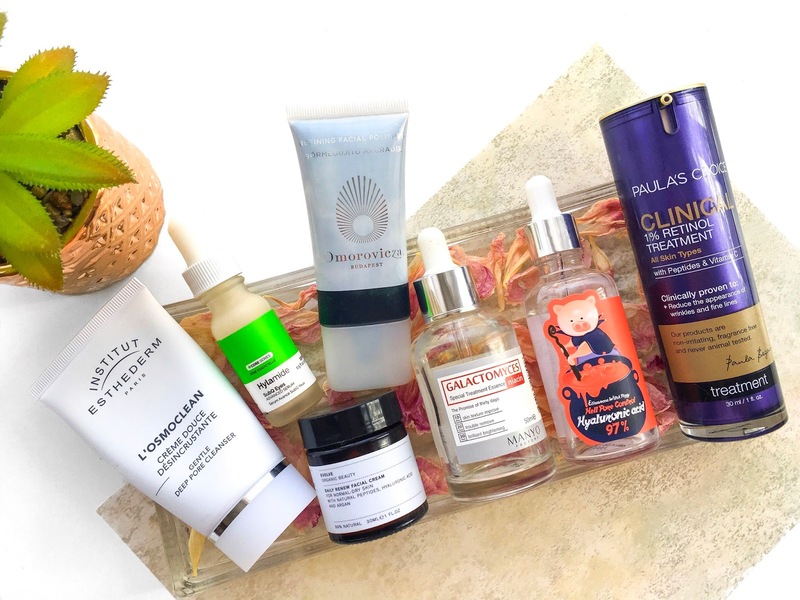 These are a few of the products that are part of my current morning or evening skincare routines and in fact by the time this post goes live, I’ll have used up a couple of these completely. I got Institut Esthederm Osmoclean Gentle Deep Pore Cleanser | £26.50 as part of my Latest In Beauty subscription which made it an absolute steal. It claims to lift impurities from the skin’s surface and unclog pores. You know a cleanser means business when it advises you to only use it a couple of times a week. I’ve been using it up to 3 times a week on my oily/combo skin and loving it. It’s a very thick cream cleanser than melts while it adheres to skin. It feels incredibly soothing and has a refreshing light skincare scent. I then use a damp flannel to remove it as I’d need to rinse my face more than a several times otherwise. It leaves my skin looking and feeling cleaner and smoother, and there’s no dreaded drying or tight feeling. I reach for this on mornings when I can feel my overnight products are still lining my skin. Or after removing makeup when I want a super thorough cleanse. I haven’t really enjoyed using manual or physical exfoliants since I started using acids and they’re not really products I’m drawn to anymore. Having said that, Omorovicza Refining Facial Polish | £65 (full size) is everything I wish all my exfoliators of old had been. Its like an acid peel, mud mask and face scrub in one and is so quick to use for effective results. It comes out as a dark green paste that becomes a pastel green shade as you rub it onto your skin. The instructions suggest leaving it on for a few minutes as a quick detoxifying mask so I usually apply this then brush my teeth before washing off. The granules are very small and fine but while they’re not as abrasive as the face scrubs I remember using, they are very effective at buffing away the dead skin cells on the surface and leaving a very smooth, bright complexion. Sometimes we all come across a product that we read the packaging of with sceptical eyes, scoffing at the various wild claims it makes about itself only to try it out and fall head over heels for. Well this is that product for me. Manyo Factory Galactomyces Niacin Special Treatment Essence | $24 states on the box and bottle this product states it improves skin texture after 10 days of use, clears up skin by 20 days and brightens skin after 30 days of use. So I put it to the challenge by adding this into my daily routine when I first received it from the lovely Binita. I didn’t change any of my other products up and just made sure to use this every single night (and some mornings) expecting very little difference. And boy was I pleasantly surprised! I could very literally feel the difference in my skin after using this for 3 weeks straight - my skin had this plumpness and brightness about it that I can’t describe and that I’ve never seen from using any other product. Currently I use this every couple of nights, after cleansing and toning and before serums as this is an essence and sinks right into the skin. Niacinamide is a popular ingredient that has anti-inflammatory properties making it ideal for acne, congestion and hyperpigmentation. Galactomyces Ferment Filtrate on the other hand is a lesser known ingredient, but is present in some popular skincare products (eg. Advanced Night Repair Serum) and is derived from a fungus. Don’t squeal because the results are phenomenal from helping better moisturise the skin, to brightening, refining skin’s texture, reducing the appearance of pores, fighting acne and increasing elasticity and controlling sebum production. It really is a wonderful ingredient that I’m eager to continue incorporating into my skincare even if it does mean an extra step, but who doesn’t love layering hydrating products though? I’m one of those truly blessed folks that has oily/combo skin that is dehydrated so I’m using products from across the spectrum to combat excessive oil production while I search for that hydration help I need. But I’ve been having a tough time with these kinds of serums. Elizavecca Witchy Piggy Hell Pore Control Hyaluronic Acid 97% | £9.81 contains 97% hyaluronic acid, which is a substance that is able to hold a large amount of moisture, thereby hydrating the skin’s surface better, improving the appearance of lines by plumping up the skin and giving a smoother feel to the skin. This one is very similar to The Ordinary’s Hyaluronic Acid Serum, with the same thick gloopy texture that takes ages to absorb and dry down into my skin. Again, I don’t mind using it but it just doesn’t hydrate my skin enough and sometimes it only takes an hour for me to get that tight pulling feeling when I’ve applied this. I’m still working my way through this but I just have to apply a hydrating toner, mist and sometimes even an oil layer alongside this. I’ve wanted to try an eye serum for the longest time but the Dr. Dennis Gross one that I want is just a little too dear for me to splurge on. So I think Hylamide SubQ Eyes Advanced Serum | £27 is a perfectly decent one to use in the meantime which so many people seem to love and enjoy using. This peptide serum claims to help with both surface and beneath surface level hydration, appearance of lines, puffiness and dark circles and textural issues. I've been using this every night and most mornings for the last month and I can’t really comment too much on these claims and any results except that I do notice my fine lines are less visible when I apply concealer which is great. I like the light texture of it and find it absorbs easily, and it’s hydrating enough to use alone but I personally like to apply an eye cream on top regardless. I don’t know how much it’s helping or improving my eye area but I enjoy using it. And if at the end of the bottle I miss it, I would happily repurchase even if I don’t actually see any results as I’m hopeful there they may be things going on that I’m not eager eyed enough to notice. I’ve recently introduced Paula's Choice Clinical 1% Retinol Treatment | £53 in my skincare routine after using up the Merumaya one that I loved so much. Although it makes out to be very potent, I actually find this to be quite gentle especially because it is combined with so many hydrating ingredients and has such a lovely emollient texture. It doesn’t dry out my skin and I haven’t had any flaking from using this. I like to use this on alternate nights when I don’t apply The Ordinary Advanced Retinoid, so after my treatment serums as a pre-night cream cream. In terms of any results I can’t really say, but it’s a product that I’m confident will be maintaining if not improving my skin over time and I really enjoy using it which is always important to me. My only issue is that there is no way to gauge how much product I have left which is a bit of an oversight in terms of design because they could easily preserve the integrity of the ingredients and include a tiny little window somewhere even nearer the bottom to see how much product remains. I've been using this deluxe sample of Evolve Beauty Daily Renew Natural Face Cream | £24 (full size) a British made, natural and organic cream. At first I felt it had a coconut scent but then with daily use it started smelling weirder and weirder to me. I’m not sure why. Having said that, it’s a lovely formula that sinks right in and doesn’t leave any greasiness on the face. As we entered the colder temperatures I did find I needed to mix this with a rich oil to get it to work for me. I paired it with Antipodes Divine Face Oil which is very rich and nourishing to make this into a super cream. It’s a lovely moisturiser for applying makeup onto as it provides such a smooth and plump base. This has definitely made me curious to try more from this little boutique brand.